Paying it forward – a Liebster Award! Last week I was intrigued, surprised and delighted to find that I had been nominated for a Liebster Award. and I was delighted to receive the nomination from fellow blogger, Harriet the Bloom whose blog is “A place for educators to reflect, recharge, and revive.” Thank you, Harriet, I am indeed honoured. In reality, before feeling delighted and honoured, I felt a little confused. Confusion, if acted upon, leads to learning. So I headed over to Google and Harriet’s blog to see what I could find out. Nominating others for the award is like paying a compliment forward. Congratulations! You just won the Liebster Award! What are you going to do next? The immediate answer is contained in this post. The longer term answer is: keep on blogging! 3. Describe your thoughts on your very first job. In my early teens I swept out a carpenter’s workshop on a Sunday morning. It was hard, dirty, tiring work. The head of the heavy wooden broom was about 60 cm long and difficult to manoeuvre. It would take about 2 hours to sweep up all the sawdust and I would go home and sleep for about the same length of time to recover. For hours I would be blowing black dust out of my nose, but the crisp $1 note I received in payment was sufficient encouragement for me to return and do it all again the following week. 4.If you could go anywhere in the world, where would you go and why? I would love to visit Monet’s garden. I would love to sit on a seat near the bridge overlooking the waterlilies and ponder the big questions of life. I would like to share my contemplations with the artist, his contemporaries and philosophers from all eras. I love the works of Impressionist painters, especially Monet’s Waterlilies and Van Gogh’s Starry Night. The mood evoked by these beautiful paintings is especially conducive to philosophical musings. 5. I like food. What is your favorite recipe? Whenever we have a family get-together it is expected that I will make a pavlova. It is enjoyed by all generations, and although I make a double (using 8 egg yolks) there is rarely any left over. 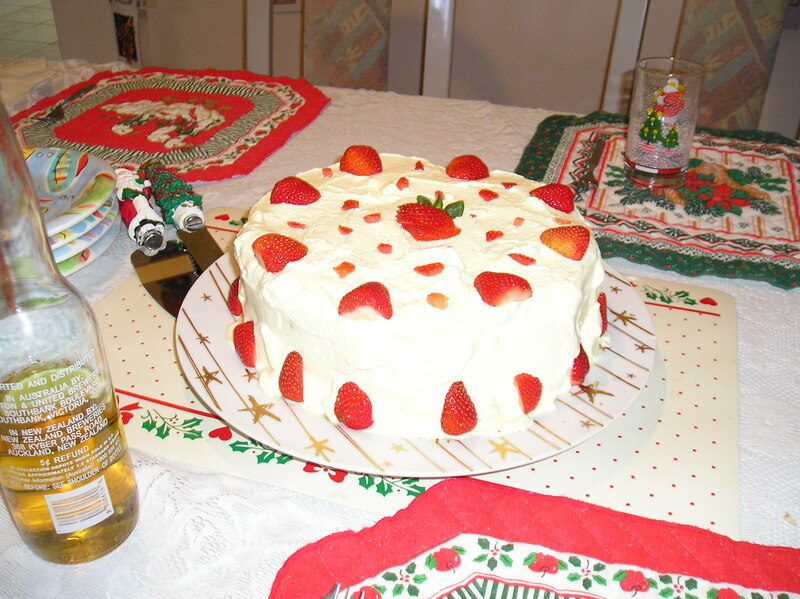 However, for birthdays and Christmas with my immediate family (husband and children) I usually make a strawberry torte. It is a special treat that I have been making on these occasions for almost 40 years. While the in-laws find it a little rich for their taste buds, the grandchildren are taking to it in true Colvin fashion. 6. Give a short summary of the book you are currently reading. As usual I have a few books “on the go” at the moment, but the one of which I have read most at this stage is “Why ‘a’ Students Work for ‘c’ Students and Why ‘b’ Students Work for the Government: Rich Dad’s Guide to Financial Education for Parents” by Robert Kiyosaki. Of course it appealed to me because of its relevance to education and because I had read others of his books years ago: “If You Want to be Rich & Happy: Don’t Go to School” and “Rich Dad Poor Dad”. In this book Kiyosaki contends that schools don’t educate students for financial success and urges parents to teach children about finances at home. He suggests that playing “Monopoly” is a great way to start. He is greatly concerned about the “entitlement mentality” which he considers to be so pervasive in our society. Some of his ideas are challenging and confronting; others make perfect sense. I recommend the book to anyone wanting to achieve financial independence. I would love the opportunity of discussing his ideas with others. Blogging wasn’t a goal, or even an idea, initially. My intention is to create my own website to market teaching resources that I produce. I have a lot of learning to do before I am ready, and part of that learning involves attending seminars. Some of these seminars recommended having an online presence and building a “brand”. Blogging was suggested as one avenue for achieving this. I decided to give it a go, and have found it rewarding in itself – an unexpected pleasure, delightful detour and amazing adventure. My blog is simply my name; that wasn’t difficult. 9. What do you do when you experience writer’s block? Eat. Procrastinate. Go on with something else. Push through it. Write around it. 10. Which post are you most proud of and why? Provide a link. The discussion stretched my thinking and learning and I am grateful to all participants in the conversation. Learning is what life is all about! As the rules appear to be blurred rather than definite e.g. Harriet’s rules differ slightly from those on Wording Well , which differ again from those on Sea Play Photography, I decided to nominate 13 bloggers. I’m starting with Belinda Pollard of Small Blue Dog Publishing because it was Belinda’s recommendation that prompted me to enter the world of blogging and tweeting. At a seminar hosted by Queensland Writers Centre last year Belinda urged all writers to have an online presence. She said that Twitter was like the water cooler for writers. I’m beginning to see that she was right. Belinda’s posts about all aspects of writing and self-publishing, including blogging, have been a great source of information for me and I appreciate what I have learned from her. Belinda, I know you have thousands of followers on Twitter but Word Press tells me that you have fewer than 200 followers on your blog so I hope you are happy to accept this award. Anne Goodwin’s website is rich with things to read: short stories, interviews with authors, book reviews, blog posts and more. Anne is one of the writers I met at ‘the water cooler’ and we have had many interesting and thought provoking conversations since then. I love the way Anne has called her website Annethology and her blog Annecdotal. She tweets @Annecdotist. Very clever! Caroline Lodge blogs at book word . . . about books, words and writing. She joined with Anne and me and we stood around the water cooler sharing ideas and exchanging thoughts. I’m certain you will find much of interest on her blog including suggestions for blogging, great books to read and writing tips. For a little bit of poetry I recommend PS Cottier who posts a poem every Tuesday, and occasionally writes prose. Teachling is a blog dedicated to improving education with ideas about teaching, learning and parenting. Teachling believes that “Improving a child’s life-chances is everyone’s responsibility” Along with me and millions of others, Teachling is a big fan of Ken Robinson. A bit closer to home (actually much closer to home, it’s my daughter’s blog) I’d like to recommend There’s No Food. Bec blogs about “wholefoods, vegetarianism, slow living and their existential friends.” She has interesting thoughts about the impact of our food choices on the environment and practical suggestions for changes we can make to our everyday routines. Glenn at Obscure Pieces expresses himself through black and white photography. His special interest is urban and landscape photography. He frequently offers support and comments on my posts and has generously allowed my use of some of his photographs. Thanks Glenn. On her Cultivating Questioners blog, Nicole posts about her experiences as a teacher, especially encouraging her young students to use higher-order thinking skills . I love to see a young teacher so passionate about education. Nillu Nasser Stelter is a fiction and freelance writer and her blog features short stories, flash fiction and tips for writing. I love the ways she uses words effectively in her writing to create a picture or emotion. Charli Mills at Carrot Ranch Communications also blogs about writing. As of Wednesday 5 March she launched a flash fiction challenge. Each week writers have the opportunity to accept the challenge to write a 99 word “story”. This is something I haven’t done before so I’m hoping to join in the fun. What about you? I’m sure it’s not as easy as it sounds! Now my nominees, it is your turn. Note: Although I have listed 13 questions, you need answer only 10. You may substitute one of your own if you wish. What is something you wish you had more time for? What is one change you would like to make in the world? What is something you would like to change about yourself? What surprises you most about your life – something good in your life that you hadn’t expected, dreamed of or thought possible? What ‘big” question do you often ponder? What sorts of things amuse you? If you could talk with anyone and ask them to explain their ideas and/or actions, who would it be, and why? What is something you can’t do without? What is something important you learned about life, and how did you learn it? I look forward to reading your responses and continuing our discussions at my place or yours! Lo and behold, you will be provided with the number of followers. Easy for Word Press. I wasn’t sure how to find out for others not using Word Press so I sent them a message on Twitter asking their numbers. Simple. This entry was posted in Blogging, Celebrations, Early childhood education, Education, Philosophy, Poems and tagged Affirmations, education, learning, Liebster Award, motivation, philosophy, Self-esteem, thinking, thoughts and ideas, Writing on March 9, 2014 by Norah. Thank you, Norah, for inviting me to “Pay It Forward”! For my Monday Writing Tips, I focused on the Liebster Award: http://carrotranch.com/2014/03/25/take-time-to-play/. You’ll find my answers at the link below the text (Paying It Forward). Thanks, Charli. I am looking forward to reading them! Hi Anne. Thank you for your kind comments. I look forward to reading your responses. I hope the questions are not too difficult to answer! Not difficult, just merit a bit of thought – and I’m stretching my award over three posts, milking it for all I can! Thank you very much for the nomination. I feel a bit sheepish to say that I received this nomination two weeks ago from another blogger as well, but had not yet responded on my website. With delight, I will tackle both sets of questions, but since I am yet a greenhorn blogger, I will combine the pay-it-forward portion and nominate 10 other bloggers (not 20)! I must say, what draws me back to your blog and your comments is that you are noticeably a life-long learner and that is an attribute I admire in people. I feel that it stimulates my own learning and keeps my connected to the world around me. I resonate with your answer to #7, as I started a blog to build my “brand” as a writer in preparation for my novels. You are wise to be building your presence for the education programs that you are developing. Thank you so much for the honor and I will pay it forward! Thank you, and congratulations on your second nomination. I would have to say you are doing very well for a “greenhorn”. I look forward to reading your responses. Congratulations on the award!! A little hard work, dedication and persistence pays off. I’d heard of the award in vague sense but never quite knew exactly what it was and how it happened. I agree with Belinda Pollard, you’re pavlova is seriously impressive! Thank you for the nomination. You’ve posed some very interesting questions and I look forward to delving into them when I’ve got a moment or two. Thanks Hope. I look forward to reading your responses! Hi Nor, it’s really great to see your fascinating responses to these questions! I’d love to see you answer those you’ve posed to your nominees. Thank you for the nomination, too! You’re welcome, and thank you Bec. I did think it might be a fair thing for me to answer the questions as well. I’m planning on doing so, at some stage soon, and will share them either as a post or on my “About” page. I’ll let you know when I do! Thank you for nominating me, Norah. That’s very generous of you! I do have more email subscribers than WordPress followers, so I hope that doesn’t disqualify me. You’re welcome, Belinda. As I said in the post, I am very grateful to you for your advice. I don’t know that it matters about the number of subscribers. I was happy to nominate you. If you are happy to accept it – so be it! I think pavlova is one of the easiest things to make! Delicious too! You are welcome, Nillu, and thank you. I agree that it is a great way to get to know and support other bloggers. There are so many wonderful people out there, just waiting to meet each other! I loved your response to the question 3: Describe your thoughts on your very first job.